I‘m back after a brief vacation from cooking, blogging, and blogging about cooking. When She Who Must Be Obeyed suggests that you take a break, you listen. Or else.
. This is the dish that required the purchase of an entire suckling pig, broken down into its components. I’ve already posted about what I did with the head, but this recipe used just about everything else but the feet. There are a total of eight sub-recipes, but I started my week-long prep-and-cooking adventure with two of the simpler components. If you have a look at the size of the bellies from my little piggy, you’ll see that they aren’t large enough or thick enough to cut into inch-thick squares. Bellies, the cut below the ends of the racks. Too small for bacon, but still good eatin'. Fortunately, I had a thick rectangular slab of belly in the Belm Utility Research Kitchen Deep Storage Facility. I assembled the rest of my ingredients, and ran into my first problem. 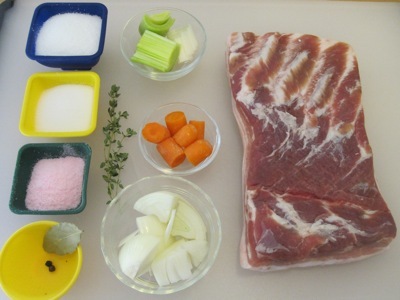 The brined pork belly sub-recipe called for twenty grams of Hobbs’ Curing Salt, from the purveyor that supplies bacon to Keller’s restaurants. A quick call to Hobbs’ confirmed that it would take at least a week to receive the curing salt, but the very friendly gentleman there revealed the crucial piece of information: the cure is nitrite-based. I modified the brine based on proportions found in Michael Ruhlman’s Ratio. Sixty grams of kosher salt, thirty-five grams of sugar, twenty grams of sodium nitrite, a small bay leaf, two black peppercorns, half each of a small leek, carrot, and onion, and a thyme sprig. I added the salt, sodium nitrite, and sugar to a cup of warm water, stirring to dissolve. I added the remaining brine ingredients and enough water to make a volume of one liter. 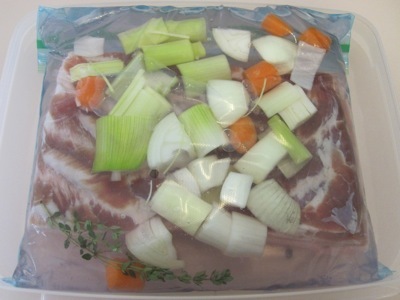 I chilled the brine, then combined the brine and belly in a zip-top bag. 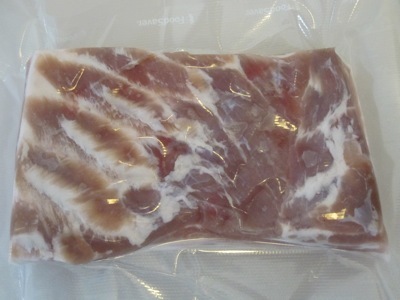 After an overnight stay in the fridge, I discarded the brine and sealed the belly in a sous vide bag. 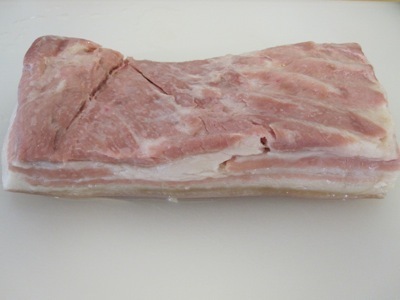 I cooked the belly in a 180 °F water bath for twelve hours, let it rest for ten minutes, then chilled it in an ice bath. 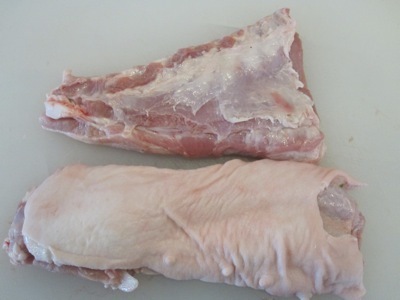 I refrigerated the belly until it was completely chilled, then sliced off the skin and any excess fat. I reserved the skin for the next recipe, and stored the belly in the fridge until it was time to assemble the completed dish. 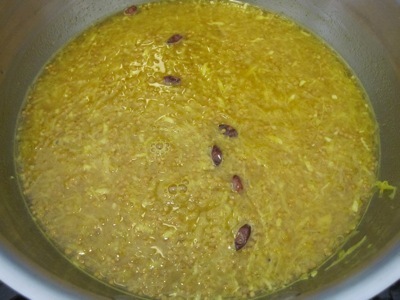 A mostarda, as described by Keller, is “a traditional Italian condiment or preserve, defined by its sweet and spicy flavors.” In this recipe, the mostartda would stand in for the fruit accent usually found in a pork dish. 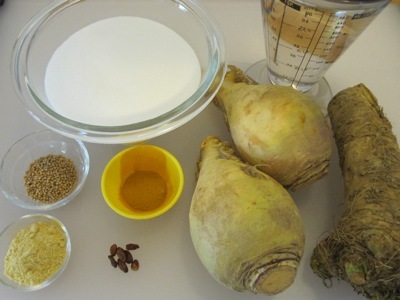 Once the pork was brining in the fridge, I assembled the next set of ingredients: five hundred grams of sugar, half a liter of water, horseradish root, two rutabagas, some small dried chiles, five grams of dry mustard, eight grams of mustard seeds, and one gram of tumeric. I made a simple syrup with the sugar and water, bringing the water to a boil and dissolving the sugar in it. I grated sixty grams of horseradish (and had clear sinuses for the rest of the week) and added it to the syrup along with the remaining ingredients. 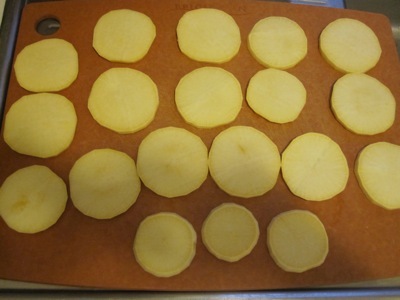 While the syrup chilled in the fridge, I peeled the rutabagas and cut them into quarter-inch slices on a mandoline. 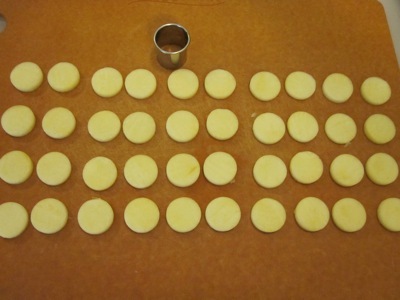 Using a one and one-eight inch cutter, I punched forty rounds out of the slices. 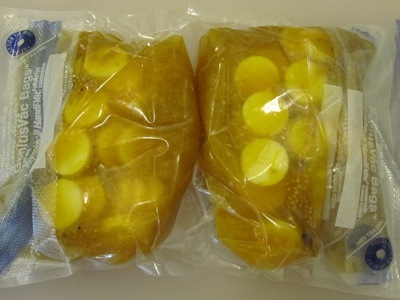 I divided the rounds and syrup between two sous vide bags and cooked them at 185 °F for two hours. I chilled the bags in an ice bath, then refrigerated them until needed for final assembly. Not a bad day’s work. Things would only get more complicated from this point on.